Excellent introductory video from Google’s Martin Gorner covering the handwritten 0-9 digits recognition problem using the MNIST data set. Code is Python using the Tensorflow library. He begins with a single layer network, progresses into a multi-layer network and ends with a convolutional neural network, showing how improvements in techniques correspond to better test accuracy. Covers softmax, sigmoid, ReLU, matrix transformation, convolutional networks, over-fitting, test and training accuracy. Well worth a watch for beginners and has better explanations than some full courses online. Note: they figure out the microphone feedback situation around minute 15 or 16. OpenCV provides the flip() function which allows for flipping an image or video frame horizontally, vertically, or both. Building on our previous example of opening a single image, this guide will explain how to open multiple images. The easiest way to load multiple images is to put all the images into a single folder and loop through the directory opening each one. This guide doesn’t introduce any new OpenCV functions you shouldn’t already be familiar with from the previous example, but we will include new packages os and os.path to make a list of images to process. Note OpenCV offers support for the image formats Windows bitmap (bmp), portable image formats (pbm, pgm, ppm) and Sun raster (sr, ras). With help of plugins (you need to specify to use them if you build yourself the library, nevertheless in the packages we ship present by default) you may also load image formats like JPEG (jpeg, jpg, jpe), JPEG 2000 (jp2 – codenamed in the CMake as Jasper), TIFF files (tiff, tif) and portable network graphics (png). Furthermore, OpenEXR is also a possibility. The following code will get you started to load and display an image with OpenCV and Python. Chuck Severance, clinical professor at the University of Michigan’s School of Information, recently published a new textbook in 11 days because he was able to remix an existing textbook. 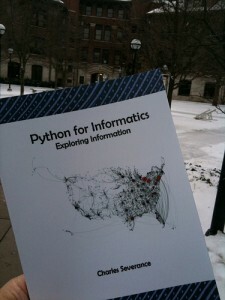 The book, Python for Informatics: Exploring Information, is currently being used in his winter semester Networked Computing course. The textbook is based on the openly licensed book Think Python: How to Think like a Computer Scientist by Allen B. Downey. Students are able to take advantage of the University Library’s Espresso Book Machine to print on-demand copies for approximately $10. Python for Informatics is available under a CC BY-SA license. Severance explains, “the book is a cool example of a situation where I’ve finally got to the ‘remixing’ bit of the Open promise.” The first 10 chapters are done and eight more are planned for completion by April 2010. Read more of Chuck’s thoughts about remixing an open book. Creating this open textbook was a part of a larger effort by Chuck to support his course with openly licensed content, and current versions of lecture slides and videos are published via the PythonLearn website. In a past iteration of the course, Chuck went through the dScribe process developed by Open.Michigan to create an OER version of SI 502, available under a CC BY license.